Andrea Patrick Forte, Pageant Superstar, Columnist for Supermodels Unlimited and Talent Agent, will be out guest Tuesday, July 1 on the PageantCast. And what a show! Make sure to stomp on by on July 1 for the PageantCast! Yes, the tables have been turned. Listen at your own risk! I promise nothing!!! You can start guessing now how many times I will say “PageantCast” in the interview. It’s an hour with NO BREAKS! Yikes! 2008 American Dream winners Held in New Orleans, Louisiana June 21st. I wanted to share with you my new website. You may find information on how you can help in the prevention of domestic violence as well as raise the awareness of domestic violence! Please, feel free to sign my guest book! Let’s continue to make a difference in the state of N.C. and our Nation as well! On June 4th Valley High Elementary invited me to be a guest speaker at their Fifth Grade Graduation. This was a special day for over 80 fifth grade students as they closed the door on their elementary education and look forward to their middle school years. I still remember my fifth grade graduation (I had a great pink dress and my first pair of pink high heels…hey it was te 80’s! lol), so I wanted to be sure I had something memorable to say. During my presentation I shared with them my three magic words – Aspire, Seek, and Attain. You are never too young to set a goal, work hard, and accomplish that goal. I think I even reminded a few parents how easy it is to work towards a goal. Who says Greek life in college can’t teach you something! My senior sorority sisters would be proud to know I took our motto and hopefully inspired a whole new generation. After the ceremony I joined students, parents, faculty and staff for a celebratory reception; then the kids were off for summer vacation and I was off to the office to go back to work. I miss summer vacations! Detroit, USA – Kelly Best, Miss Michigan USA 2007 and a Miss USA 2007 semi-finalist, was named Miss International US 2008. Kelly Best (born 26 September 1986) is a beauty queen from Troy, Michigan who competed in the Miss USA pageant in 2007. Best won the Miss Michigan USA 2007 title in a state pageant held in Port Huron, Michigan on 21 October 2006. 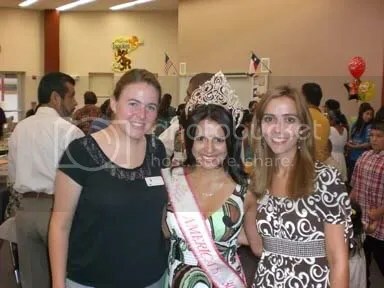 It was her first attempt at the title, although she had placed fourth runner-up in the Miss Michigan Teen USA 2004 competition and was a semi-finalist in the 2002 event. Best competed in the Miss USA 2007 pageant broadcast live from the Kodak Theatre in Los Angeles, California on March 23, 2007 and placed in the top 15. Her “sister” titleholder is Caitlin Klug of Eau Claire, Miss Michigan Teen USA 2007. She will represent the United States in Miss International 2008, in Macau, in November.